India’s effort to break the old boys’ club is producing bizarre outcomes. Tycoons have responded to a requirement that they have at least one female board member by April 1 by appointing their wives and even stepmothers as directors. India’s corporate governance has room for improvement and gender diversity at the top can improve financial returns. But mandating change isn’t the answer. Though a handful of women have risen to prominent positions in India’s financial sector there is a shortage of supply in most industries. A report by Credit Suisse published in September found that women held just 7.1 percent of senior management positions in India in 2013. That’s less than one third of the level in Malaysia which has set a quota for 30 percent of boardroom representatives to be female by 2016. Some Indian companies have broken the spirit of the rule by making token appointments. Reliance Industries, the country’s largest conglomerate by market value, has installed the wife of Chairman Mukesh Ambani as a director. The stepmother of tycoon Vijay Mallya now sits on the board of a company in which he has a large stake. Meanwhile highly qualified women – such as Ramni Nirula, the former CEO of ICICI Securities – are in such demand that they sit on up to seven different boards, the maximum allowed for an independent director. These efforts will complicate any attempt by the Securities and Exchange Board of India to impose penalties on companies that fail to fill the quota. More than 30 percent of the 1479 companies listed on the National Stock Exchange of India were yet to appoint a woman to their board as of March 15, according to data compiled by PRIME Database. A global trend towards gender quotas has raised awareness about the under-representation of women but it remains unclear if the benefits trickle down. Norway, for example, introduced a 40 percent female quota for boards back in 2003. Yet a detailed study published last year called “Breaking the Glass Ceiling?” found no evidence that the gains at the top led to increased female representation in other senior positions, or that it closed the pay gap for women beyond the board. At this rate, India’s diversity drive may be even less impressive. 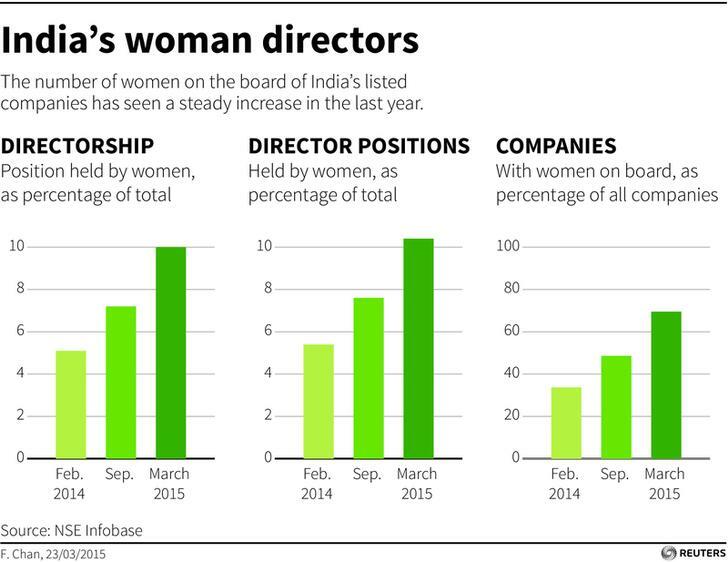 Over 30 percent of companies listed on the National Stock Exchange of India were yet to appoint a women director as of March 15, according to data compiled by PRIME Database. India’s regulator has warned of serious consequences for companies that fail to meet the April 1 deadline to appoint at least one woman to the board of every listed firm. “I’m very categorical: if people do not follow it willingly, then it will have consequences. And the consequences will be as per the law and can be very serious,” U.K. Sinha, chairman of the Securities and Exchange Board of India (SEBI), told reporters on March 20. He did not say what the consequences would involve. Nita Ambani was appointed to the board of Reliance Industries last June. She is the wife of Reliance Industries’ chairman Mukesh Ambani. Mangalore Chemicals and Fertilizers named Ritu Mallya as a director of the company in December. Mallya is the stepmother of Vijay Mallya, the chairman of UB Group which is a large shareholder in Mangalore Chemicals and Fertilisers. An initial deadline for companies to meet the quota was set for October 2014 and was later pushed back to April 2015.